Among many of the draw points for VoIP is the ability to use your service from pretty much anywhere you have a stable internet connection. SIP further expands this by offering a common platform for interoperability. Many users are stuck with ATAs (Analog Telephony Adapters) and softphones. This essentially limits you to your local environment and requires many changes, or otherwise cumbersome adjustments, once you decide to become mobile. Luckily with the introduction of WiFi SIP phones to the market users now have more options for mobility and more comfortable VoIP experiences. Once such WiFi phone is the UTStarcom F3000 which is a clamshell factor device. This device features all of the features you would expect from your standard SIP phone plus a small size which makes it easily portable. Here we will configure the F3000 through the web interface in order to register to Callcentric to allow you to place and receive calls. The information presented in this guide is based on Version 5.90st of the F3000 firmware. If you are running a different firmware version some of menu options and settings may be different. This guide assumes that you have connected your F3000 to a wireless gateway, have a valid IP address and that you have administrative access to the administration web interface. NOTE: We have tested the F3000 and found that the method it uses for call transfer is not supported by Callcentric, in either blind or consult mode. You can however use call holding properly with our servers. SIP Authentication String: This is either the default extension 1777MYCCID OR 1777MYCCIDEXT, where 1777MYCCID is the 1777 number assigned to you by Callcentric and EXT is the three digit extension you are trying to register this UA to. SIP Terminal User Name: This is either the default extension 1777MYCCID OR 1777MYCCIDEXT, where 1777MYCCID is the 1777 number assigned to you by Callcentric and EXT is the three digit extension you are trying to register this UA to. 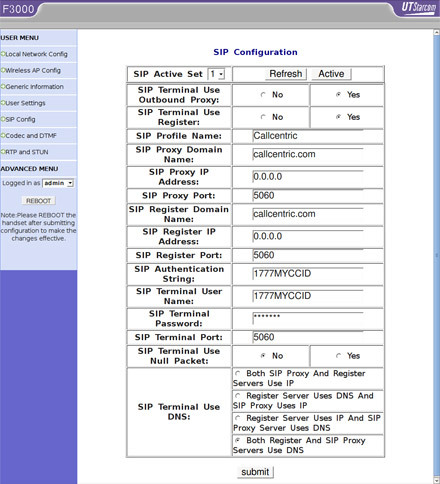 SIP Terminal Password: Enter your extension SIP Password here. Your extension SIP password is the password you created for the extension you are trying to use. You may edit the SIP password you wish to use in by logging into your My Callcentric account and clicking on the Extension menu link and then modifying the appropriate extension. 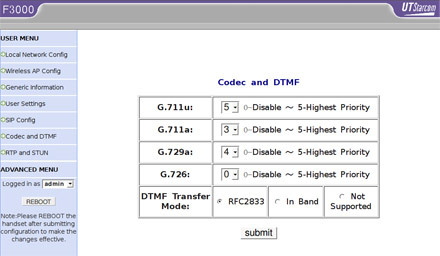 And set your DTMF Transfer Mode to RFC2833. Once done click on submit to save your settings. Before you reboot your phone you will want to make sure that your DNS Query Type is set to SRV on your RTP and STUN page. You can also verify that Use STUN is set to do not use STUN. Once done click on [submit].